Playing on these swings outside an arts centre in Guimarães, Portugal, generates electricity to power lighting under the floor (+ movie). 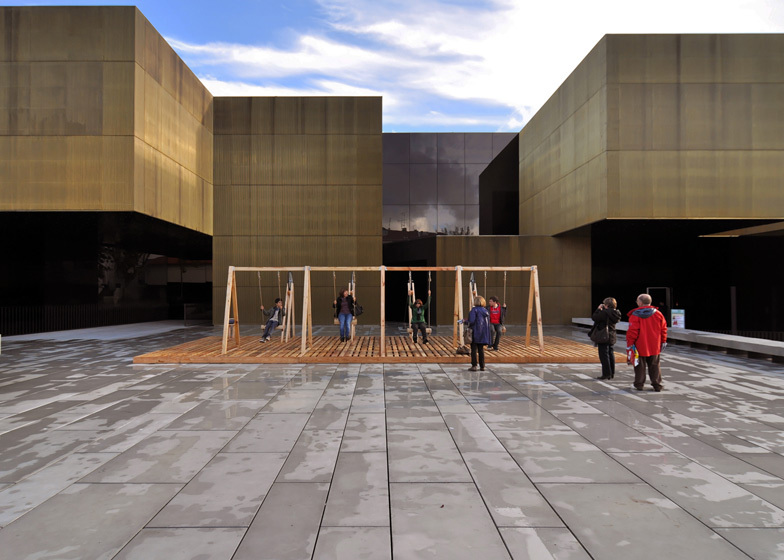 Oporto- and Berlin-based collective Moradavaga built the installation, titled Swing, outside the brass walls of the International Centre for the Arts Jose de Guimarães, which we reported on following its completion this summer. As each swing moves back and forth, a bicycle chain attached to it turns a wheel which then turns a dynamo to activate the light below. The swings are built on a base of wooden pallets, which also hides the mechanical parts. "Based on the principle of swinging to produce electricity, Swing is also an ode to the rich industrial heritage of Guimarães, reflected in its mechanical devices and sounds evocative of the ones once produced in the factories of the city," say the designers. "Traditional hemp rope, wooden beams, bicycle chains, wheels, dynamos and lights complete the material palette used in the installation giving it an old-style look and a low-tech kind of feel," they add. Created for the Pop Up Culture programme in Guimarães, which is the European Capital of Culture for 2012, the swings will remain outside the arts centre until 16th November. Previously on Dezeen we've featured a swing attached to the underside of a dramatically cantilevered house and a pair of swings fixed to a raised billboard frame. We've featured a few other installations from Guimarães this year, such as a cinema with upright viewing pods that visitors have to crawl inside and a project that invited locals to lounge on garden furniture in the city's fountains.